Nov 12 - Day 3 - miles 3700: We get up at 5.30am to get into Mexico City for a run on the GrandPrix circuit. later on today they are having the Champ cars on ( their F1) Adrian drives all day and enjoys the circuit. Then we go up into the hills for 4 speed sections. We do really well. 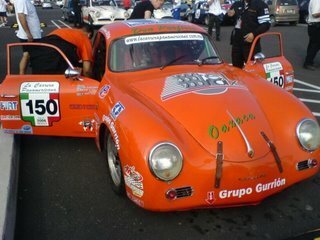 We chase the Mexican orange 356 off in the second stage and despite his 30 second start we catch and overtake him. Hes 5th in our class and we increase our lead by 3 mins over him today over the rest of the stages. The car is 100% and even the new exhaust sounds fab. Only one casualty today the yellow/blue corvette that went into the wall at the race circuit. A few other cars are having mechanical issues...but we seem to be going well. Joe and Javie strip out the brakes and do an oil service. Back up to 60th and 4th in class. Day 4 tomorrow.Conrads turn?! ?